In northern Sweden, the snowmobile is the most common form of transport out in our beautiful winter landscape and a perfect way to get to know the Arctic wilderness. Book your snowmobile now and get ready for the adventure. The Northern Lights are one of nature's great displays that is most commonly seen in the Arctic regions. Every performance is different, a beautiful, shifting dance of nocturnal rainbows that is a humbling and spiritually uplifting experience. No better idea than enjoying a typical dinner under the northern light. Go for a unique trip in north, in the middle of Lapland, the northernmost part of Sweden. Polar winter is a magical spectacle with endless nights lit by the stars and the white of the snow reflecting the pastel colors of the northern lights. This is an epic adventure that you would get to experience every aspect of a life as a musher in the Arctic. 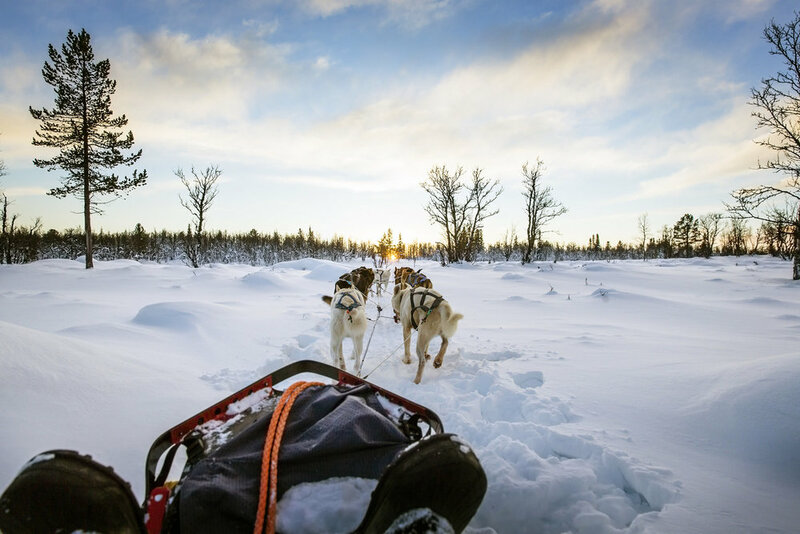 Feel the power and the enthusiasm of the dogs and feel the chill on your face as you drive your own husky team through hushed forests, up snowy hills and over frozen lakes. This trip will bring you in total wilderness with only wildlife as neighbors. 5 days is the requested time for the one that want to experience the main activities that local people were and are doing and this for generations.